It’s that time of year when Christmas-themed online slots start popping up everywhere. Play’N Go’s Holiday Season slot is one of the first to appear, and it has some nice features for players to enjoy. Along with the Secrets of Christmas slot from NetEnt, we think this is one of the better slots to play at Christmas this year (so far…). The Holiday Season slot is a 5 x 3 online slot game from Play’N Go, and it takes place on a festive shopping street with a huge Christmas tree at the end. It looks like a dream come true as it’s not packed with shoppers! The background features some impressive details but it’s the action on the reels you’ll be interested in most. If you like your games to be straightforward, this one ticks that box while still offering a nice perk in the shape of free spins. As you’ll see though, these are no ordinary free spins. This is the main feature offered in the game, and while there are no other bonuses featured, this one delivers enough to make the game worth playing. Well, we’ve already mentioned the detail this game offers, and the graphics are very good. The reels move smoothly as well, and the game has great pace. A lot of work has gone into making the symbols look as impressive as possible, and that counts for a lot when you intend to play a game for a while. The controls are all set out at the bottom, and you can use autoplay once you’re happy with your bet amount. You don’t have to play every line, but we recommend you do, especially as the game only has 10 in total. This paytable only has three pages, two of which reveal all the symbols you can expect to see. The lowest-valued ones are as you’d expect – A, K, Q, J and 10. These appear in gold on the reels. Meanwhile, the better symbols to get are the man with a champagne glass, the woman wearing a Santa hat, the clock approaching midnight, a festive turkey and what looks like a wobbly jelly. I’d have replaced the jelly with a Christmas pudding personally, but there you go. The wild and scatter symbols are mentioned on the paytable too, but we’ll come to those in a moment. Okay, so when you start playing the Holiday Season online slot game, you’ll notice the red gift box finished with a golden bow is the wild symbol. Five of these can win you 1,000 coins if they all appear on the same line. This plays by the usual rules in that it replaces everything except the scatter. This is a champagne bottle and glass, and it is well worth looking out for. You need three or more scattered champagne bottles to trigger some free spins. Except they’re not called free spins in this game – they’re called win spins instead. As you might correctly guess, this means every spin is a guaranteed winner. It’s more than possible to get more than one win on a spin too, so your total winnings from this feature can add up very quickly. There are a couple of other things to mention about this round. Firstly, you can trigger it to happen again up to three times by getting another three scatters on a single spin. Secondly, even if you don’t do that, every additional champagne bottle to appear will give you a further two win spins. These will be added to your remaining total, displayed at the top of the reels. Total winnings are at the bottom underneath the reels. We liked the win spins feature and managed to win 1,320 coins on our first attempt. We got a total of nine win spins too, and we noticed you tend to get a lot more wilds in play with each spin than you do in the regular base game. They’re not exactly rare in that part of the game either, but we regularly had three or four appearing with each winning spin. Most players will find a size of bet they’ll be happy with when playing Play’N Go’s Holiday Season slot. Playing the smallest penny coin means you can spin from just 10p a time. You can also go much higher to lodge a £100 bet per spin. It’s possible for one player to win up to 500,000 coins per game in this slot. The free ‘win spins’ can trigger the biggest single prizes, with a chance to win up to 10,000 your bet per spin. The slot also has a good return-to-player percentage of 96.51%, which is one of the higher ones around now. 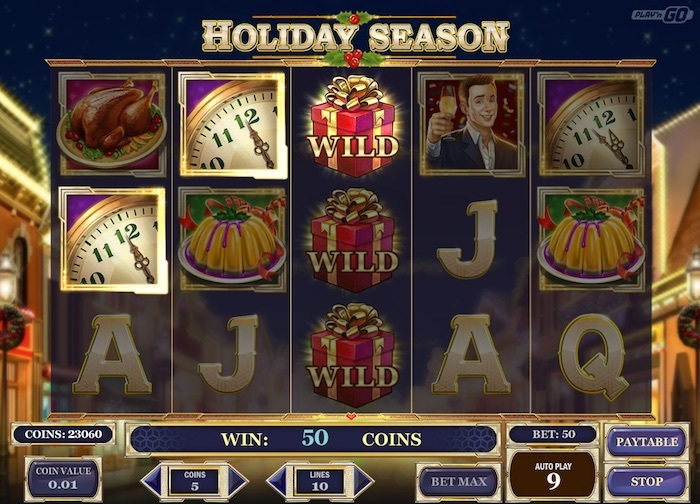 There will be other new Christmas slot games to come this year, no doubt, but the Holiday Season slot is a good place to start. It’s worthy of attention for those win spins alone, so if you’ve yet to try it, give it a go today, even if you start by playing for fun before betting real money on it.